Karma, Buddha said, is fundamental to how we see, feel, think, suffer, enjoy, get sick, fall in love. And karma all starts from the mind. Ven. Robina will lead a weekend workshop on how changing our mind (and thus our karma) can lead to a radically different experience of life, and create the causes for happiness. DROP-INS FOR SUNDAY ONLY ARE WELCOME. WE WILL ALSO STREAM THE TEACHINGS LIVE ON OUR FACEBOOK PAGE. (courtesy of robinacourtin.com) Ordained since the late 1970s, Ven. 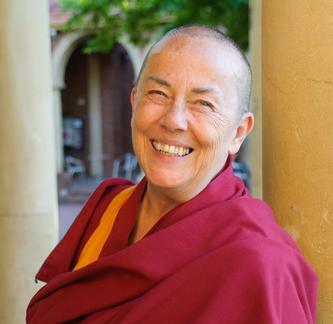 Robina has worked full time since then for Lama Thubten Yeshe and Lama Zopa Rinpoche's FPMT. Over the years she has served as editorial director of Wisdom Publications, editor of Mandala Magazine, executive director of Liberation Prison Project, and as a touring teacher of Buddhism. Her life and work with prisoners have been featured in the documentary films Chasing Buddha and Key to Freedom. See a full biography and information about Ven. Robina's work and schedule here.